and we want YOU to join in the fun. 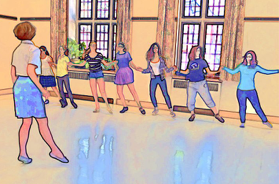 There are many Social Groups in Toronto and area, and all welcome dancers from other places. Visitors are also welcome at monthly dances, Balls, and Dancing in the Park.
. . . Tara M.
The video above is from a ball in Bologna, Italy. The dancing is not specifically correct, but it is joyous fun! 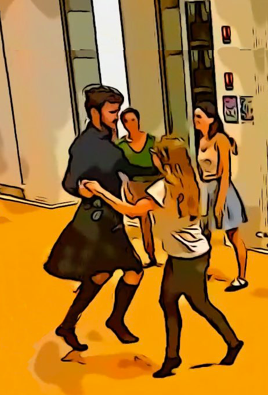 Scottish Country Dance is lively, multi-generational, and rollicking good fun! There are 6 “monthly dances” each season, with wonderful live music. The March dance, and Family Christmas dance, especially welcome dancers from the Beginner Classes. There are two formal /semi-formal balls each year, and many special events. Here are some video links to show you typical dances, and typical Toronto dancers! About Scottish Social Dance. . .
Scottish Dance: It's old. . . it's new. . . it's fun. . . it's social. Scottish country dance is the traditional social dance of Scotland. It’s based on ancient folk dances, mixed with elements of ballet, influences from the Royal court of France, and some overlap with Highland dancing. Scottish country dance was carried around the world by Scottish immigrants, and by Highland regiments. It remains popular world-wide, and in unlikely places such as Paris, Japan, and Moscow <some international events>. SCD is great fun for young and old but it IS challenging mentally and physically. You must be fit, and quick on the uptake. Some people can pick it up on the fly, but the better way is to take Lessons. Some of the dances we do are over 300 years old; many are newly (and cleverly) devised to incorporate intricate formations. We dance lively jigs and reels and the distinctively Scottish, very stately, Strathspey. We also dabble in marches and waltzes. To learn more, click on Lessons. Classes for young people are available here. Any number of journal articles and studies have shown the social and health benefits of dancing in general and Scottish country dancing in particular. Anyone who dances Scottish country will tell you "It's fun!". RSCDS Toronto is a not-for-profit affiliate of the Royal Scottish Country Dance Society, Edinburgh, Scotland. HM Queen Elizabeth is our Patron.